Has It Really Been 50 Years?! 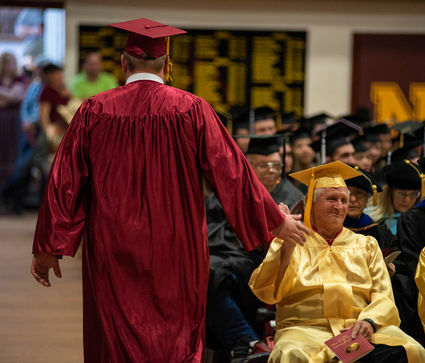 Each year, Northern Golden Graduates — the class celebrating its 50th anniversary – are honored at the MSU-Northern Commencement. Chancellor Greg Kegel will welcome you to campus and discuss all the exciting happenings at Northern. Ride in “The Goose” and relive memories in the places that shaped your college experience. Take a tour of Donaldson Commons. Enjoy an evening at one of Havre's fine dining establishments. All Golden Graduates and their families meet in the Library to put on gowns and enjoy a light breakfast. Golden Grads will march in the processional with the 2019 graduates. Special seating will be provided for family attending the ceremony. Please indicate on the registration form if you plan to attend Commencement and how you would like your name listed in the program. Photos from last year's festivities. I plan on attending my 50th graduation anniversary!